South-east Queensland in Australia was battered by a series of severe thunderstorms late on Saturday. The Australian Weather Bureau said sustained winds of 80 km/h were recorded in the Brisbane area. Thousands were left without electricity when strong winds brough down power lines. 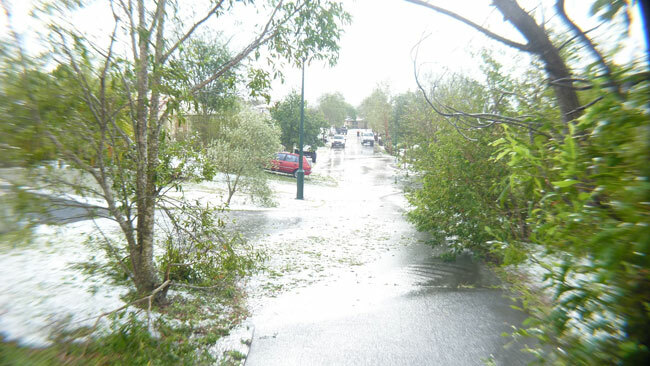 Large hail also fell throughout Queensland’s most populous city. Hail stones as big as 2cm were reported in Mt Alford, with even bigger ones seen west of Toowoomba. Wind gusts of up to 80km/hr an hour battered Warwick and about 2000 homes and businesses on the Sunshine Coast lost power during the storms. Lightening strikes also caused bushfires in areas of the state's north, central and western regions. Golf ball size hail reported at Albany Creek, 4cm hail was reported at Marburg, 2cm hail was reported at Oxley. Firefighters battled over 30 blazes, with seven people from an isolated property near Barcaldine forced to flee their home around 3pm after a fast-moving fire threatened their property at Narbethong. The Bureau of Meteorology issued rolling warnings for people in Brisbane, Gold Coast, Lockyer Valley, Logan City, Ipswich, Scenic Rim, Redland, Cherbourg Shire and parts of the Gympie, Moreton Bay, Somerset, South Burnett and Toowoomba council areas.